As you have probably gathered from my last few posts, I did something very special over the last few days. 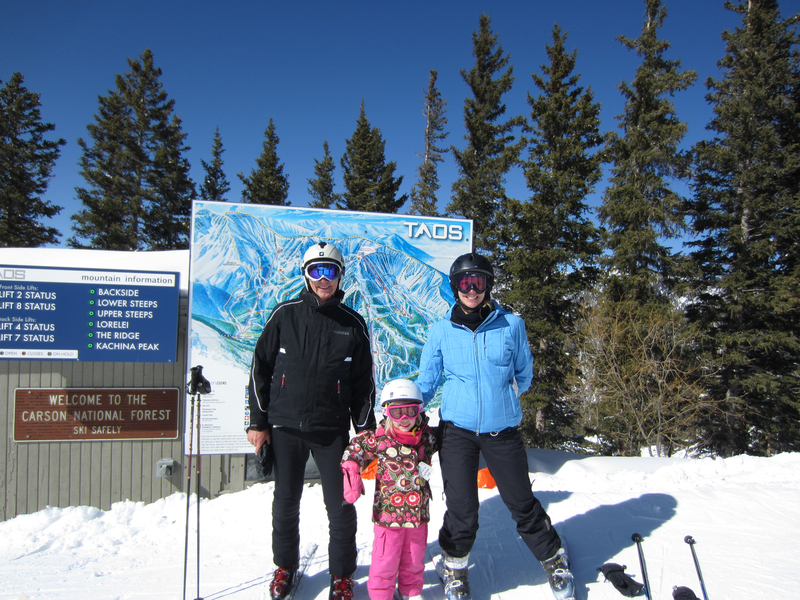 Me, my father and my five-year-old daughter Sophia took a three-generational ski trip to Taos, New Mexico. It was the first time (except when Sophia was a meager four-months old) that I had ever truly traveled alone with my daughter and it also was the first time the three generations got together for a weekend away. My son and husband were off on their own adventure thus it was just me and Sophia this time. 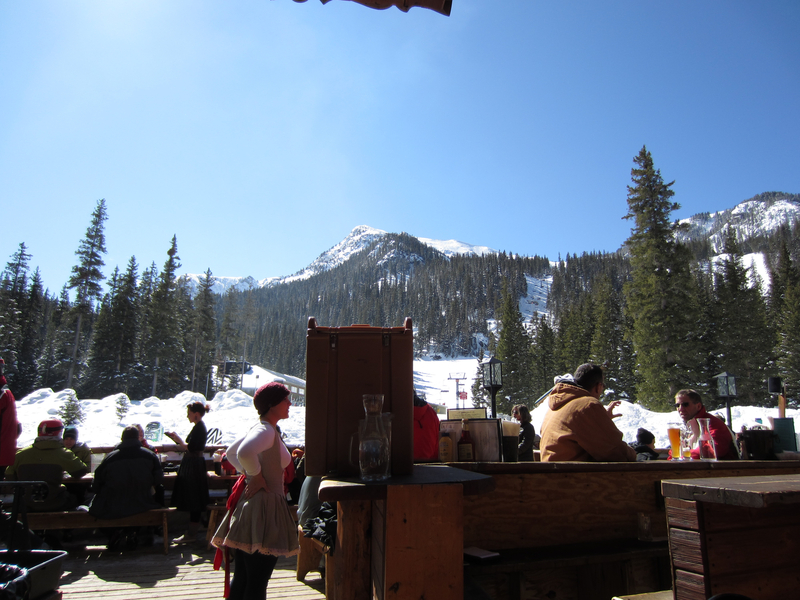 We picked Taos for many reasons. First, it is relatively easy for us to access. It is a non-stop flight from Tucson where my father lives as well as from Minneapolis (where I live). 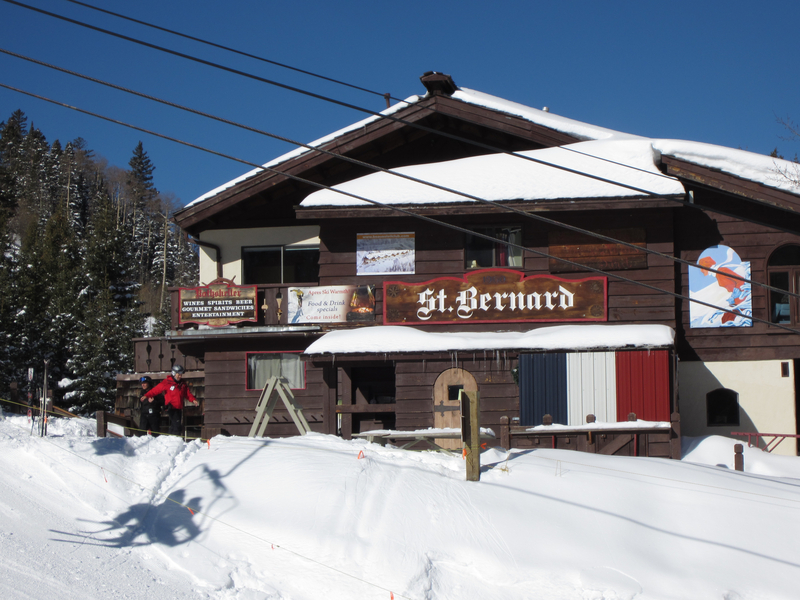 Second, it is really a cool little trendy ski town. 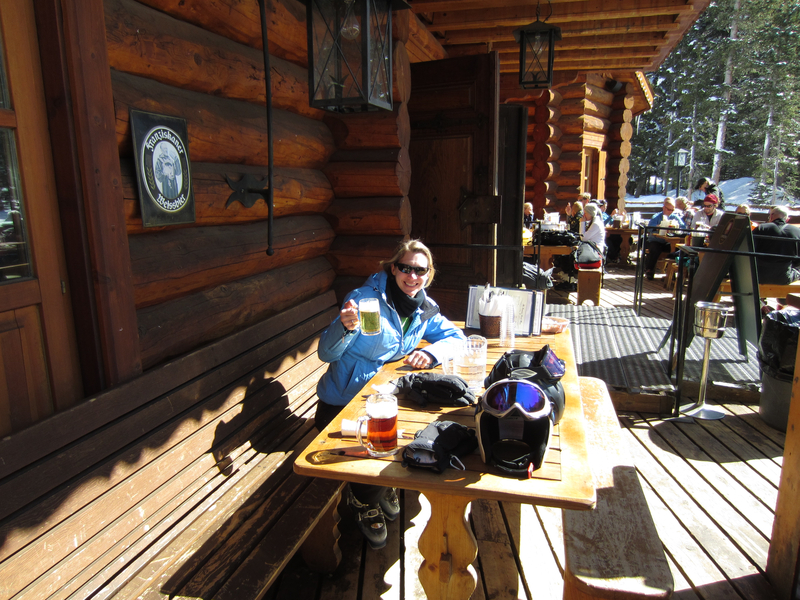 Nothing at all like the big ski resorts in Colorado or even Utah. Taos is tiny, tough and has a unique southwestern style and flair that quite honestly can’t compare. 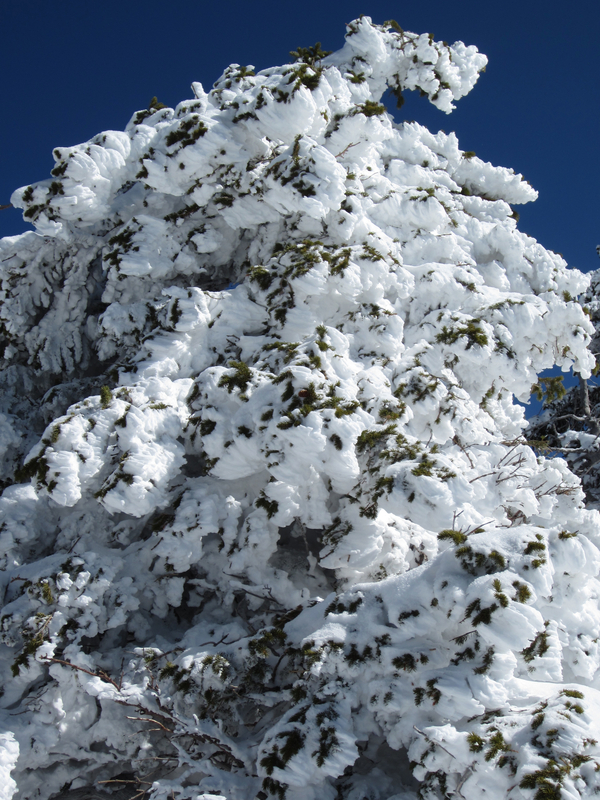 Finally, for some reason New Mexico is the only place in the country this winter that actually has good snow. Colorado, Utah and Northern California are struggling with terrible snow. 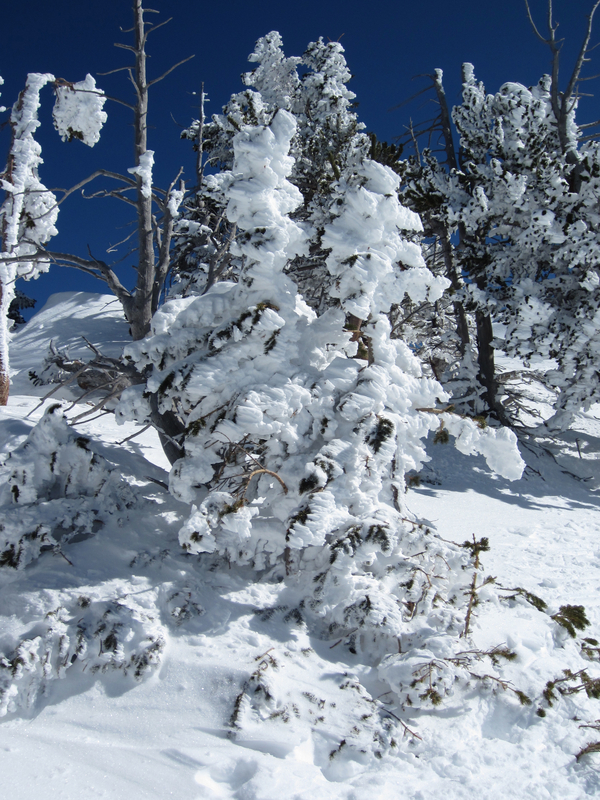 Meanwhile relatively untouristy, trendy Taos has plenty of snow. That fluffy, powdery, heavenly snow that skiers dream and drool about having. We flew in on a Thursday and were up in the mountain town of Taos by early evening. Taos is an artsy, crafty kind of town awash in adobe homes, art galleries and plenty of excellent foodie restaurant and cafes. The locals are diehards and love it there. 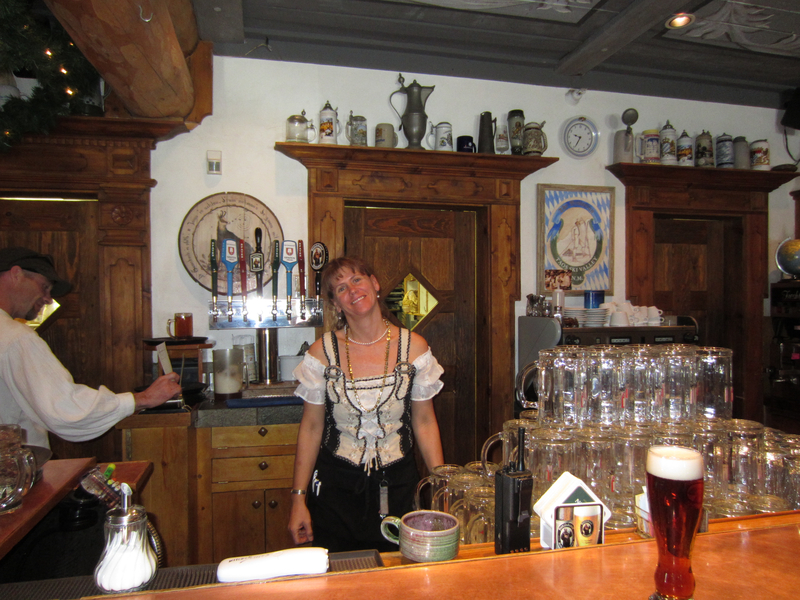 What is so cool about Taos is the true love of the place and overall relaxed, happy feeling there. People live there because they want to live there, and more importantly, because they want to ski. Everyone skies in Taos, ranging from the crazy maniac twentysomethings to the silver-topped retires (by the way, don’t let the gray hair fool you…they kick most tourists butts down the hill!). The town of Taos is small, quaint and picturesque. It is not like uber-trendy Santa Fe. instead, it is more laid back, relaxed and definitely has a western feel to it. I loved it. It is one of those places that makes you scratch your head and ask yourself, “Am I really still in the United States?” for it illustrates the immense diversity, culture and way of life in this country. Taos is as different and unique from Minneapolis as it is from London. Period. 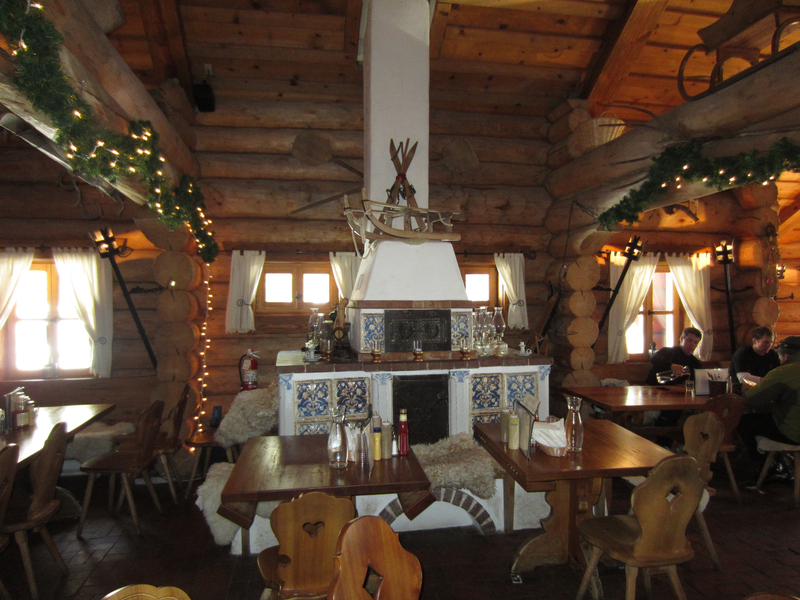 Taos has plenty of restaurants to choose from depending on your mood and taste. As we were with a five-year-old, our choices were a little limited yet we still managed to eat like royalty. Thursday night we had a fantastic meal at the Outback Pizza Place which is literally a hole in the wall that serves up some of the tastiest, meanest pizza I’ve ever had (Warning: You order by the slice but don’t let that mess with you. One slice is the size of three normal large slices anywhere else! The single slices are huge and also several inches thick). The next night we toned it down a little and ate at a nearby pub for some fish and chips and a veggie burger. We finished our stay there by having an enormous gourmet pig-out at a wonderful restaurant called “Graham’s Cafe” where the owners are a husband and wife team from San Francisco who cook up some delightful Southwestern Fare. The wife, who is the prized chef, even hand delivers your plates! After a three course meal of utter splendor, we could hardly stand up and were thankful that we skied our legs off that day. Otherwise we would have truly had “eater’s remorse”!. The big highlight of the trip was the fact that it was three generations. Never before had we done something like it and it was a “hallmark weekend” loaded with memories. The highlights included my dad and my climb up to the Ridge (see earlier post), German beers at the Bavarian right on the slopes, many delicious meals, and best of all, our three-generational ski run in which we took Sophia out of ski school early and did a long run on the “big mountain” (as she loved to call it) with her giggling all the way. At the bottom of the hill, which wasn’t an easy run for a little one or any kind of beginning skier, she told me that she “only wants to ski the big mountains”! Oh no, what kind of monster did I create? Ha Ha. I had to explain to her that unfortunately the “big mountains” are a plane ride away and we’d go broke if we flew out west every time she wanted to ski. I think she got it but can’t be sure as it is always hard to know exactly what is going on in that tiny five-year-old brain. 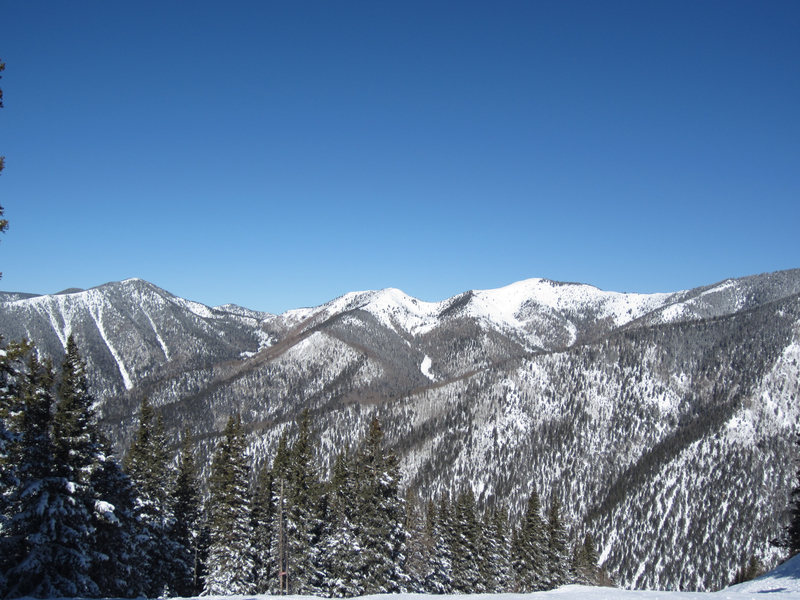 Anyway, here are some pictures from Taos Ski Valley. Hope you enjoy! 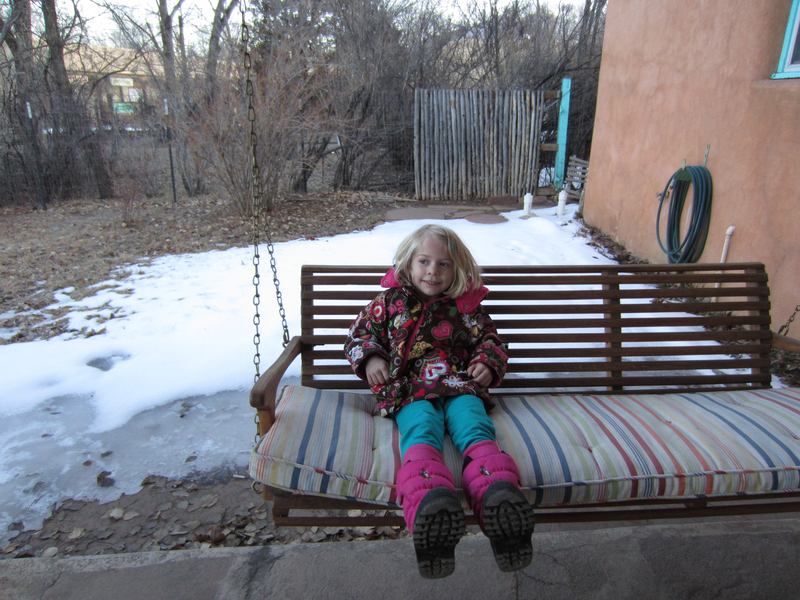 Sophia sitting happily outside our rented New Mexican adobe house in historic Taos. 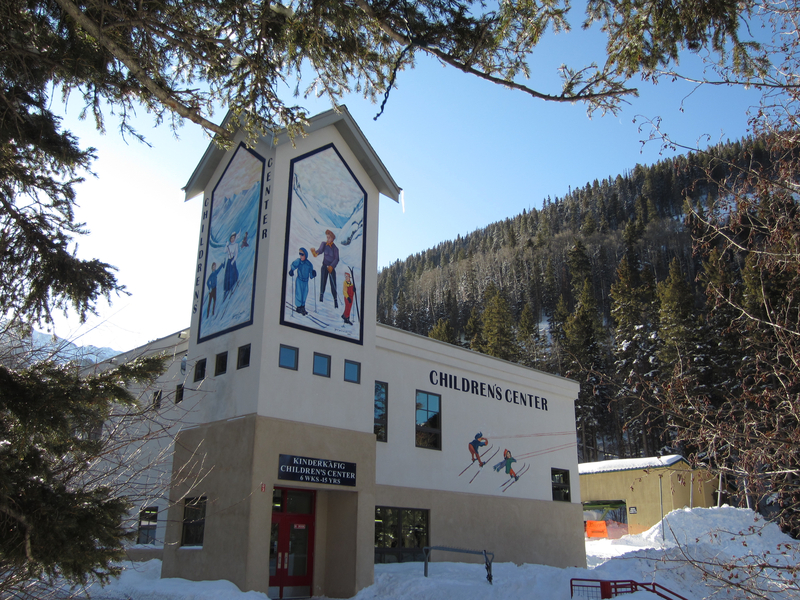 Friday morning we dropped Sophia off at the world-class ski school at 8 am sharp. Her lessons were until 3 pm….a long day for a five-year-old. First view of the mountains looking the other direction from the ski area. It had just dumped a lot of snow a few days before we came and now the weather was unbelievably perfect with the bluest sky possible. 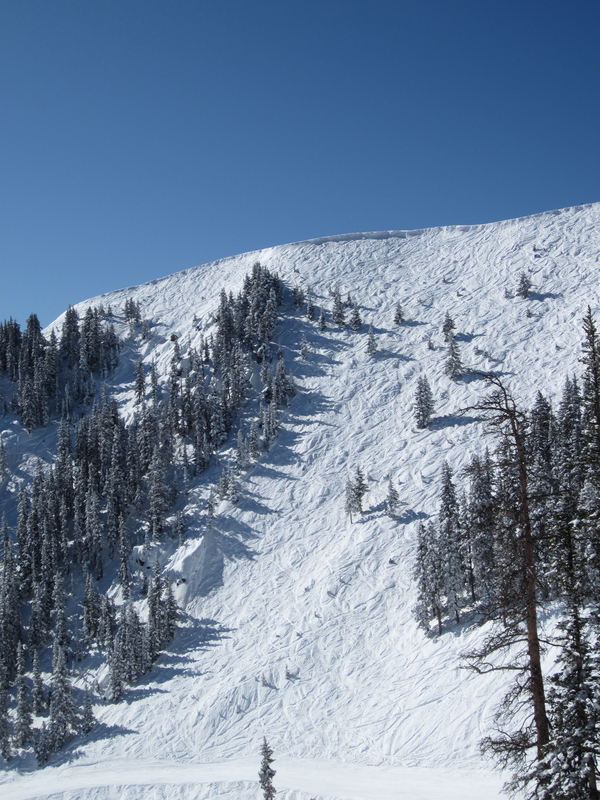 Taos used to be the place to ski for the “purists” as it was relatively unknown, hard to get to, and off limits to snow boarders until two years ago. It still has that local feeling and is generally not too crowded. It also has lots of charming places to stay and eat up on the mountain if you don’t want to make the 25 minutes commute down to historic Taos. 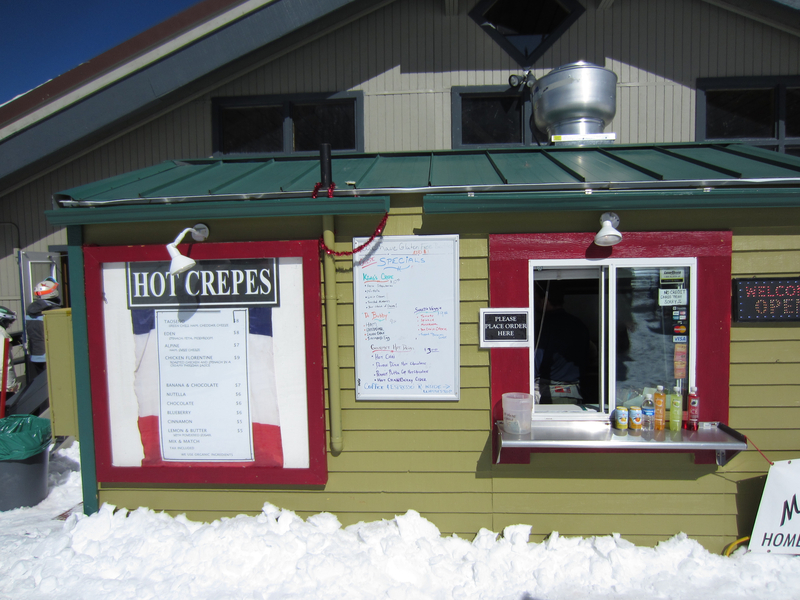 This delightful stand was next to the last lift up…I was so tempted to have a chocolate and nutella crepe but never got a chance…my one regret! 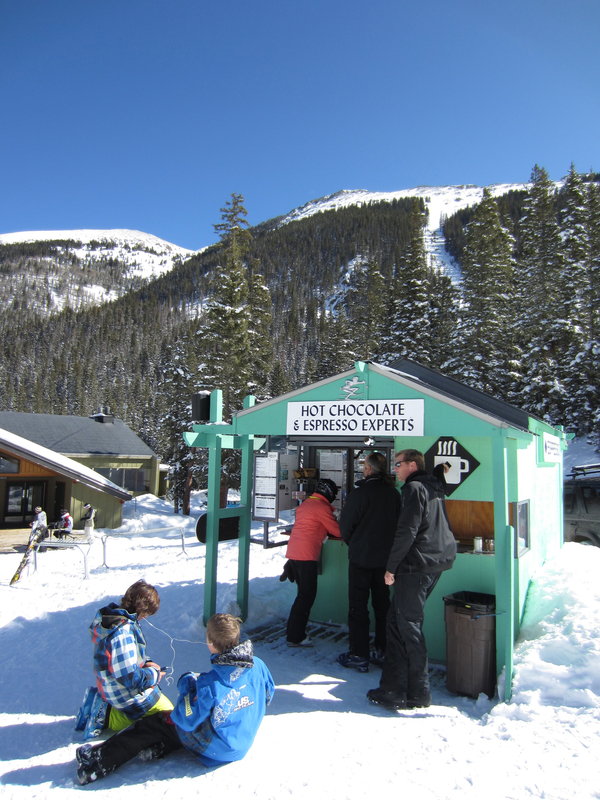 Also a handy hot chocolate stand waiting for thirsty customers (the beer joint is a few feet away and had way more business). 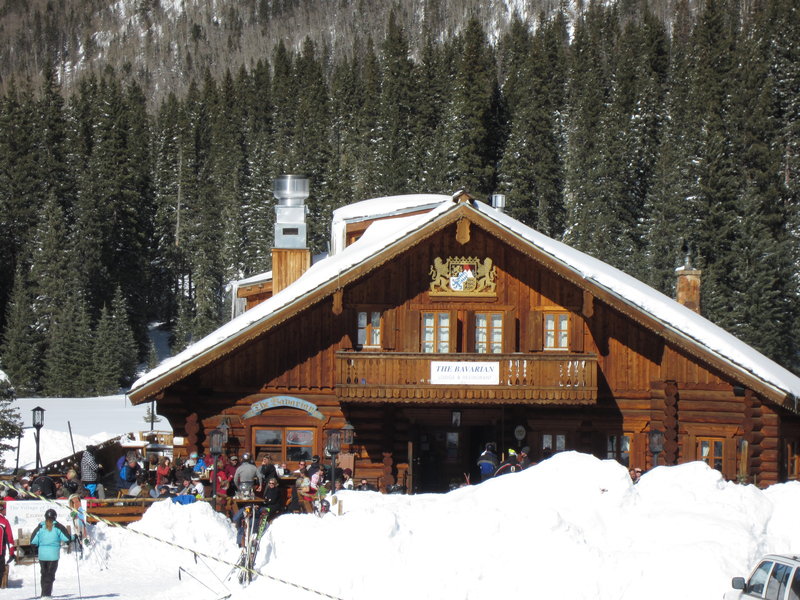 The Bavarian where the wait staff all dressed in German attire and they served hot spatzle, tap German beers and was always packed for apres-ski. Please…not another picture the bartender smiles! The inside is lovely and the restaurant is also a hotel where you can spend the night and get the real mountain experience. Tuesday nights they serve Swiss Fondue! Me enjoying a mid-afternoon beer. 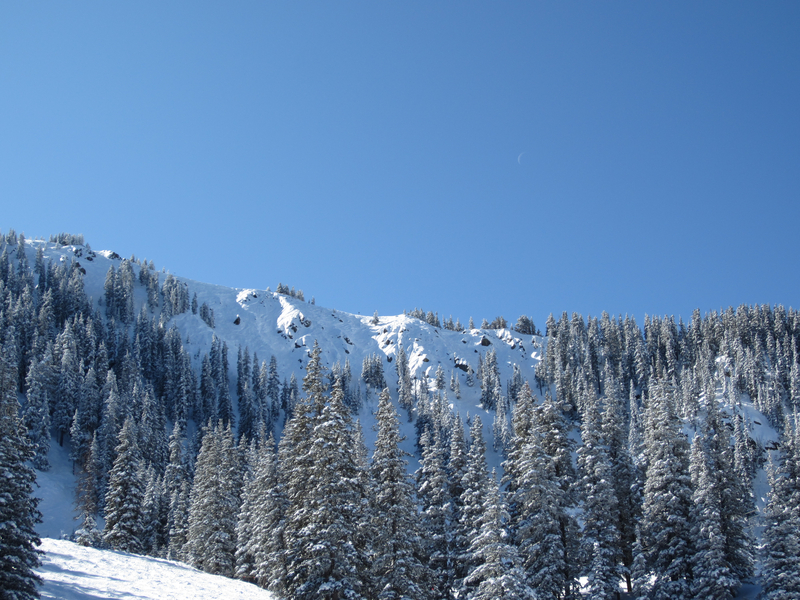 Here I zoomed in about a thousand feet up to the Ridge that we skied down earlier before. 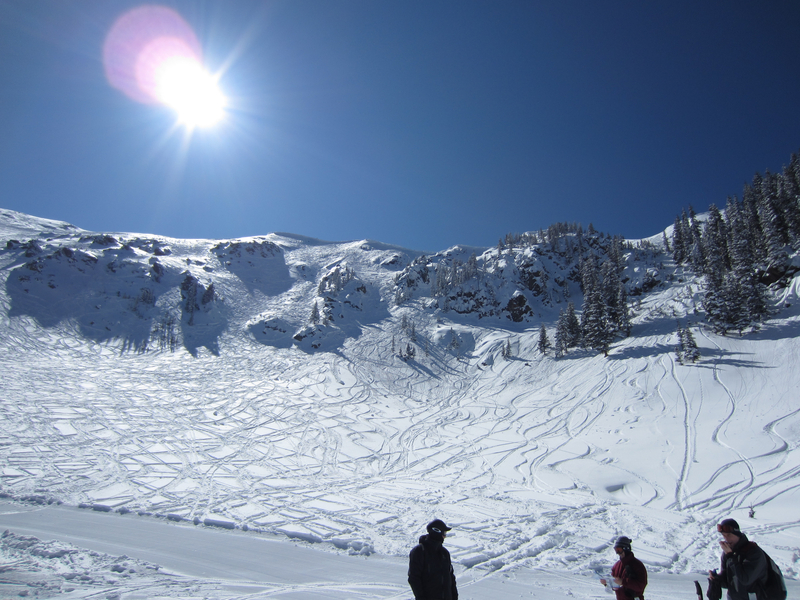 I had to take this shot even though it is right into the sun….this is the Ridge we climbed up to and skied down. Insane. Just to show you how steep this place is, the top of this mountain is a run. It is a sheer face and there was no way you’d get me down it but we saw plenty doing it. 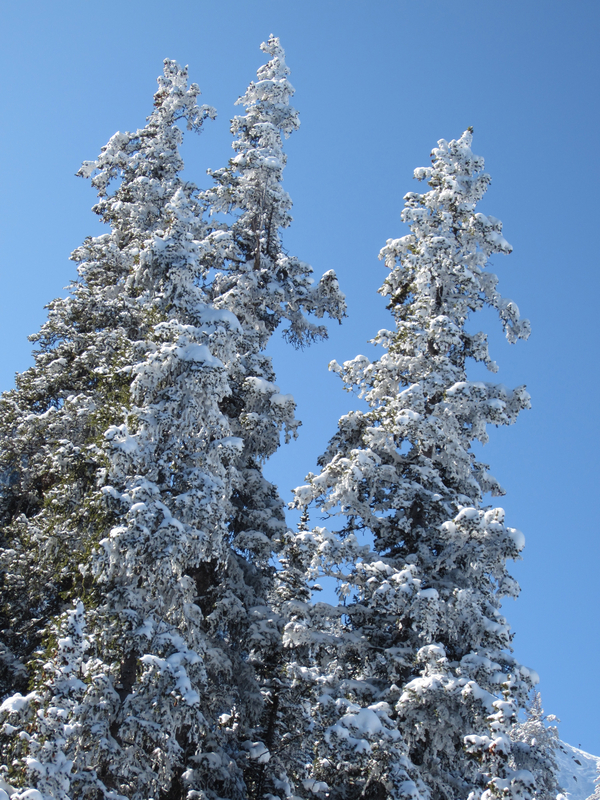 Since it had just snowed all the trees were coated and simply beautiful. It all melted off the next day so I’m glad that I captured these pictures. 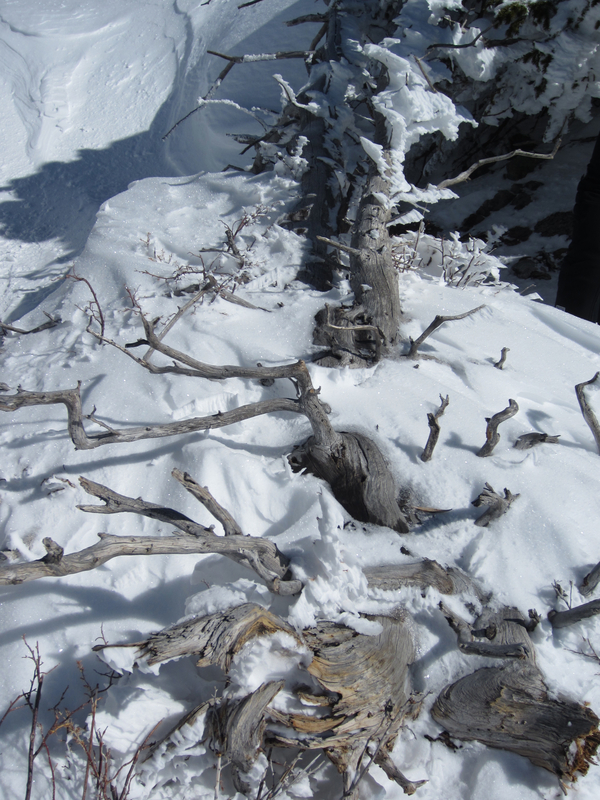 These pictures of the trees were taken on the hike up to the Ridge at 12,481 feet. See how thick the snow is! It should have been a warning of how hard the run would be! I’m saving the best for last. The highlight of the entire trip was this moment…..
To ski with three generations down a blue hill on the “big mountain” was one of those memorable moments that I’ll never forget. As a child who grew up skiing with my family, to ski with my father and daughter was truly a joy. Little Sophia screamed down the hill doing her turns and laughing all the way. She was a perfect little angel and a great traveler! I’m thinking she has gotten the travel gene from her mom and grandpa! Looks like I’m in trouble! Stay tuned…I have a few more New Mexico posts coming up and then will be back at finishing up my New Zealand posts. Wish me luck! Less than two weeks until I am off to Guatemala on a volunteer and study trip! I am one busy mom! Sometimes, when you plan ahead, you can save money by using travel and hotel promo codes. Taos is a great city, but I’ve only been there in the summer. Sounds like a great weekend. Now I want a piece of that pizza! Thank you! We sure had fun! One of those really memorable weekends!